Shop AT&T for all of your wireless needs. A friendly staff of experts can assist you with mobile phones, applications, tablets, bundles and even TV. Yes, TV. Not a day goes by that we don’t feel the impact of the police officers, paramedics and firefighters in our communities. These brave individuals keep us save and put our needs above their own. 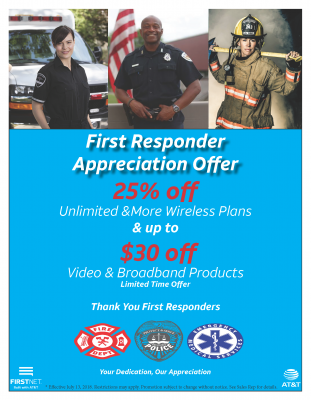 To say “thank you”, AT&T is offering firefighters, EMS personnel and law enforcement officers and their immediate families a 25% Off discount on Unlimited & More Wireless Plans and up to $30 Off Video and Broadband products.